The inferior epigastric artery emerges deep towards the inguinal ligament, via the terminal part of the external iliac artery, often straight via the source of the deep circumflex iliac artery, and also seldom as a common trunk along with the obturator artery. It is often referred to as deep inferior epigastric artery. At their beginning the inferior epigastric arteries normally possess a standard diameter around 3 mm, probably revealing the reasons why the inferior epigastric arteries give the main supply to rectus abdominis, as compared to a normal diameter about 1.6 mm on the creation of the superior epigastric arteries. Division into two arteries prior to anastomosis is one of the most normal arrangements, making up nearly 60% of scenarios, along with a trifurcation existing in the remainder. In around 30% of situations the inferior epigastric arteries rise and anastomose along with their superior counterpart with no branching. The deep inferior epigastric artery’ emerges deep towards the inguinal ligament via the terminal part of the external iliac artery and occasionally like a common trunk along with the obturator artery’, but generally straight over via the origin of the deep circumflex iliac artery. The vessel rises among the transversalis fascia as well as the peritoneum to the umbilicus till it goes across the linea semilunaris, where it enters the rectus sheath and also arises along with the posterior side of the rectus abdominis muscle. Inside the rectus abdominis muscle, the branching system of the deep inferior epigastric artery has been categorized depending on a lot of common arrangements. 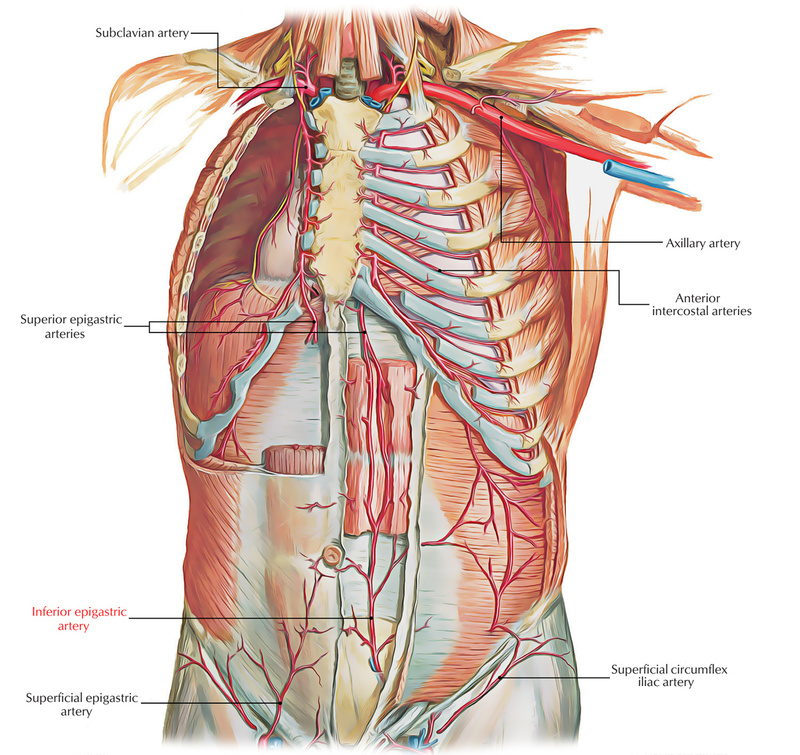 The artery travels an irregular distance on the deep side (around 10 to 15 cm) prior to going into the muscle belly. Generally, the vessel splits in, a more notable lateral ramus which rises to the level of the superior tendinous junction as well as a medial section which is pointed towards the umbilicus. Both of these medial as well as lateral rami possess intermuscular anastomotic attachments with the superior epigastric artery. The inferior epigastric artery moves upward around the medial side of the deep inguinal ring. The vas deferens when it comes to the male, as well as the round ligament within the female, enters medially right after curving over the artery at the deep inguinal ring. The inferior end of the triangle is generally created by inguinal ligament, and the medial end is made by lateral side of rectus abdominis. The inferior epigastric artery furthermore produces the cremasteric artery, a pubic branch, as well as muscular branches along with cutaneous branches. The cremasteric artery follows the spermatic cord in males, supplies cremaster and the other coatings of the cord as well as anastomoses together with the testicular artery. Within females, the artery is short and goes along with the round ligament. A pubic section, close to the femoral ring, goes down posterior to the pubis in order to anastomose with the pubic branch of the obturator artery. The pubic section of the inferior epigastric artery might be bigger than the obturator artery as well as supply the majority of the obturator artery region inside the thigh; in that case it is described as the aberrant obturator artery. The direct inguinal hernia gets in via a fault in the fascia of the abdominal wall, as well as its sac is considered for being medial towards the inferior epigastric vessels. Direct inguinal hernias may likely develop in both males and females. However males are generally ten times more prone to acquire a direct inguinal hernia A direct inguinal hernia project near the medial inguinal fossa inside an anatomic zone called the inguinal or Hesselbach’s triangle, an area determined by the border of the rectus abdominis muscle, the inguinal ligament along with the inferior epigastric artery via a vulnerable area in the transversalis fascia. These hernias are capable of leaving via the superficial inguinal ring and also are incapable to expand inside the scrotum. Femoral hernias project medial towards the common femoral vein as well as inferior towards the path of the inferior epigastric vessels. They usually have a slim conical neck, and may contract the femoral vein, creating overflow of distal collateral veins.